We are well aware how important it is to make use of renewable energy resources as much as we can. Conventional energy resources, such as fossil fuels, are exhaustible and may get vanished some day if we keep using them at the current rate. That is why technologies are being developed to harvest electrical energy efficiently and reliably from renewable energy sources such as hydropower, solar power, wind power, geothermal power etc. Wind is one of the important renewable resources we could make use of. Human civilizations have been using wind energy from thousands of years. Earlier windmills were used to pump up the water from a well or to crush grains, but the scenario has changed a lot and we are using windmills to generate electricity. 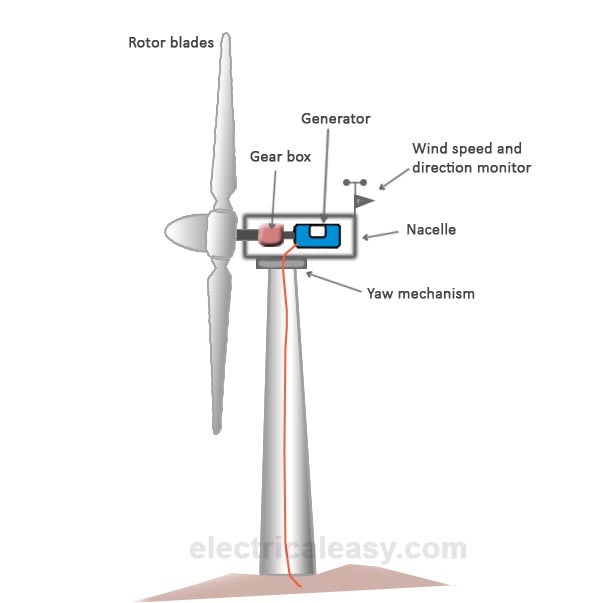 This article explains how electricity is generated from wind energy i.e. wind power. Wind possesses kinetic energy which can be converted into electrical energy. 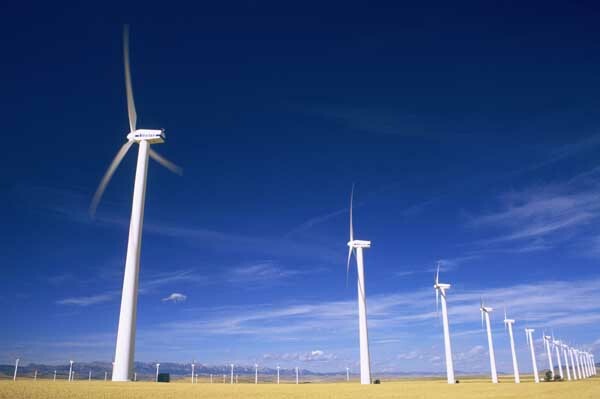 For converting the kinetic energy of wind into electricity, wind turbines are employed. The wind rotates the turbine blades, the shaft of which is mechanically coupled to an electric generator. The basic working principle of a wind turbine is as simple as it sounds! But, yes, for harnessing maximum energy from the wind, wind turbines in real are a bit sophisticated. They are categorized between two main types as - Horizontal Axis Wind Turbine (HAWT) and Verticle Axis Wind Turbine (VAWT). They are also available in various sizes and ratings. You can also find a rooftop wind turbine which can sit on the roof of your home and contributing to your electricity needs. On the other hand, a large horizontal axis wind turbine can be taller than 300 feet. It's not only about a single home, but there are wind power plants (aka wind farms) which are connected to electrical power grid. Many countries are trying to increase the share of wind power into their total generation. A wind farm (or wind power plant) consists of many individual wind turbines grouped together. There are many examples of large wind farm installations of about a couple of thousand MW capacity over the world. A wind farm can also be located off-shore. The location is selected on the basis of availability and average speed of the wind at that location. Thus, many times these are located at higher altitudes. Horizontal axis wind turbines are most commonly employed in a wind farm. The figure below shows various basic components of a horizontal axis wind turbine. Tower: The tower is usually cylindrical with the heights ranging from 25 meters up to 90 meters. An arrangement is made inside the tower to climb up at the top for maintenance purposes. Rotor blades: Usually three-bladed wind turbines are used in wind farms. The length of rotor blades ranges from 20 to 40 meters. They are made from a light-weight material such as fiberglass reinforced polyester or wood epoxy. When wind is blown, the rotor blades rotate at a speed between 10 to 60 RPM. Nacelle: It is mounted at the top of the tower and it houses the gearbox and generator assembly. It also has wind speed and direction monitoring mechanism attached. Generator: Rotor assembly is coupled to the generator through the gearbox. Thus, when the rotor rotates it drives the generator and, hence, electricity is generated. Yaw mechanism: For an increased efficiency, rotor blades must face the wind direction. But, as the wind direction changes time to time it makes sense to turn the rotor assembly to face the changed wind direction. Yaw mechanism does that!